Anne Frank’s Diary: Written in Ballpoint Pen? Was part of Anne Frank’s diary written in ballpoint pen? Part of Anne Frank’s diary is written in ballpoint pen, which did not exist during the war. Anne wrote the body of her diary with a fountain pen. Anything written in ballpoint pen was clearly done at a later date. First, there are two loose notes written by someone else and attached to Anne’s papers after the war. Second, some of Anne’s original diary entries have page numbers written in ballpoint pen, but these were obviously added at an early stage in the complication process. 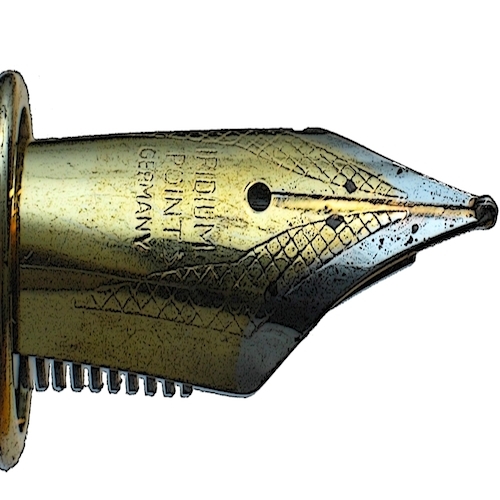 Fountain pen nib. By BenFrantzDale, Przykuta [GFDL (http://www.gnu.org/copyleft/fdl.html) or CC-BY-SA-3.0 (http://creativecommons.org/licenses/by-sa/3.0/)], via Wikimedia Commons. Anne wrote the body of her diary with a fountain pen—that is, a pen that uses wet ink. The only traces of ballpoint pen ink are confined to two loose scraps of paper put with the diary materials later (probably by Otto Frank). They are clearly in a different handwriting than Anne’s. When Otto Frank organized the books and papers after the war, he also probably numbered the pages partly in ballpoint pen and partly in colored pencil. No single entry from Anne Frank’s diary is written in ballpoint pen. Netherlands State Institute for War Documentation, The Diary of Anne Frank: The Critical Edition (New York: Doubleday, 1988), pp. 160-165.